It’s no secret that Broadway Dance Center is one of the most renowned dance studios in the world. With over 3000 students visiting the studios every week, you may have been lucky enough to take a class at BDC in the past. If so, it’s time to visit again, as BDC has just undergone a huge studio expansion! 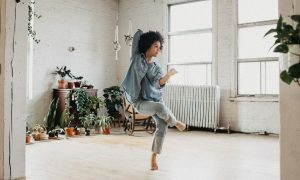 Opening new studios within the last month, BDC now has a designated tap studio, with tap classes all day, and another new, large all-purpose studio that also works as a performance space/casual theater. That equals seven large state of the art studios for BDC! 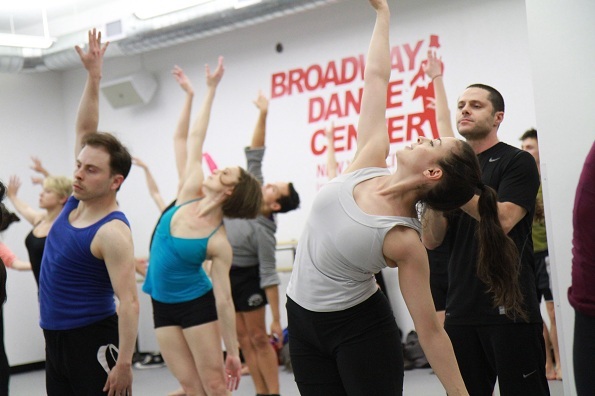 The popular studio’s expansion is welcomed with open arms by the American and international dance community who are excited to see Broadway Dance Center thrive. “It has been a great honor to be so closely involved with Broadway Dance Center’s facility expansion in the heart of the NYC Times Square Theater District. I’m delighted, that in 2012, BDC acquired adjoining space to our current facility and built two additional studios to accommodate the growing needs of dancers and performing artists”, says Reese Snow, Associate Executive Director. With an unveiling reception on Sunday April 29, the new studio space was filled with excited guests and media all eager to see BDC’s new studios. 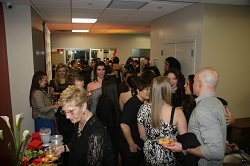 Guests were treated to hors d’oeuvres and drinks as they watched the new space evolve into a theater with performances by Parsons Dance Company, dancers from SMASH, and the young, eager students of BDC’s AIM and Professional Semester programs. Dance Informa joined in the fun and was delighted to also see the new BDC shop, which is much larger than the studio’s past merchandise area, with an expanded range and street level frontage. The new store is bound to ensure that even more dancers are clad with BDC sweatpants as they walk around New York City! With the expanded space has come a class schedule change that has kept the administration staff at the studios very busy. BDC now offers 335 classes a week in an array of levels and dance styles from more than 100 permanent and guest faculty members. “We are so thrilled to be able to open two more studios and provide our students with even more choices in dance education. We’ve carefully crafted our schedule to offer an even greater variety of disciplines and levels”, shares Diane King, Executive Director. And tap lovers are excited with the new range of tap classes, all day! “I am extremely thrilled that we now have one of our studios dedicated extensively to tap and other percussive styles of dance”, says Snow. Congratulations Broadway Dance Center. I personally can’t wait to get back to New York to take a class in one of the two gorgeous new studios! Top photo: Josh Bergasse’s (choreographer of the hit series SMASH) ongoing class at Broadway Dance Center. Photo by Vanessa Pomiechowski.